UBER – Close up on me ! All items contains the HUD with some options. Body and co. read on top! 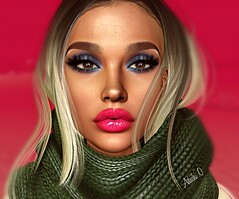 Hair : DOUX – Andromeda – Fades Pack . By David Cooper (dam1710) @KinkyEvent! Hair : DOUX – Lucia – Naturals . By Javiersasoo/By David Cooper (dam1710) NEW!! !